Posted on Tue, Mar 27, 2012 : 5:22 a.m.
Thelma was abandoned outside and she definitely didn't belong there. 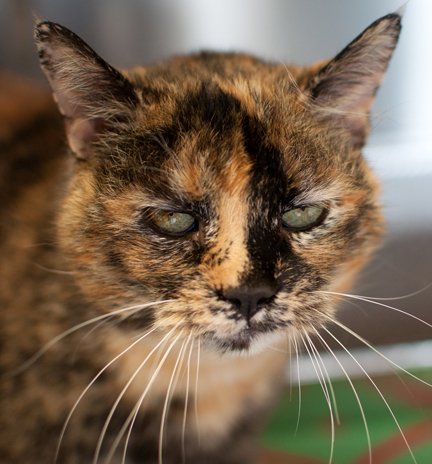 This 8-year-old, beautiful tortoiseshell cat was all too happy to have a roof over her head, a comfy bed and good food to eat at the Humane Society of Huron Valley. Thelma is a major purr bucket, for the lack of better words, who will greet you by rubbing on her cage bars, purring the entire time. She wants an inside only home where folks can dote upon her and give her tons of love and attention and a good brushing from time to time to help restore her coat to its previous luster. This sweet cat may have had a hard life, so it's time she gets what every cat should have... a warm, loving home with people who simply adore her. Believe me, it's not hard to love this friendly, affectionate cat. All of the pets at HSHV are spayed or neutered, up to date on all vaccinations and microchipped before leaving the shelter, a cost that is included in the low adoption fee. Please stop by HSHV between the hours of noon and 6 p.m., seven days a week, to visit our adoptable animals. The Humane Society of Huron Valley, located in Ann Arbor, was awarded the "Best Large Animal Shelter in Michigan" by the Michigan Pet Fund Alliance, for the second time in a row this year, for saving the most lives. HSHV is an independent 501(c)(3) nonprofit organization and relies solely on donations from businesses and individuals to support our community programs. HSHV is not affiliated with the Michigan Humane Society or any other humane organization. The mission of HSHV is to promote responsible and compassionate care of all animals in our community.